Hello! Here's an awesome post from my friend Emma. As you know, we recently downsized and we now live in our RV. Life is awesome! In August of 2015, we returned from 15 months of travel through Mexico and Europe with our young son. We saved hard throughout my pregnancy and were able to fund 15 months of travel with our savings. However, eventually our savings ran out and we had to go home. Although the savings account was decimated, my attitude to life was completely altered. I was hooked and wanted to make travel a core part of my everyday lifestyle. I came up with a slightly crazy goal of chasing the summer around the world, traveling for months at a time – between hemispheres, across oceans. Cruise ships. Train travel. Driving an RV across the US. Wherever we wanted to go. I knew we’d have to make huge changes to our life to pull it off but I was determined. Not only would we need to drastically reduce our expenses, we also had to build a business that was online so we could work on our own terms – and get paid regardless of where we were in the world. However, after time away from the workforce our retirement savings had suffered and we were moving back to a large mortgage which required a stable paycheck. Returning to an office job, whilst putting our son in daycare, in order to pay a large mortgage sounded like the complete opposite of my dream. Not one to easily accept defeat, I kept thinking and reflecting. The solution came whilst my husband and I were discussing our return home over a cafe con leche in Spain. We always assumed we’d move back into the large bungalow we’d lived in before departing for our trip. The bungalow was rented out whilst we traveled and all of our belongings were in storage. However, after almost a year of living out of suitcases the thought of unpacking all of our stuff was overwhelming. 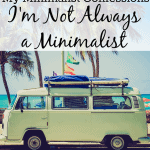 We knew that we could live a simpler life, as we’d been very happy traveling with minimal possessions. We own a smaller, 2 bedroom 860 sq/ft townhouse that was purchased as a rental investment property. I suggested to my husband that we could move to the smaller property and keep the renters in the larger house. After all, the smaller house was still bigger than almost every hotel room and vacation rental we had stayed in. After some number crunching, we decided to try living smaller and we’ve discovered it suits our lifestyle perfectly. All of our core bills have been slashed – we now have a lower monthly mortgage payment, lower property taxes, and much lower utility bills. This combined with increased income from rent on the larger house nets us over $1000 per month. That means we can afford to maintain our lifestyle on my husband's income, allowing me the financial breathing room to build the business without the pressure of needing to bring in an income right away. One of the ways we plan to fund our travels is by renting out our house on Airbnb when we travel. An older, larger house in the suburbs isn’t as appealing to guests as a more compact and well-serviced property, close to public transit and beaches. The house will need a full renovation – including a new kitchen, bathroom and dining room conversion – to be up to vacation rental standard but the work is not super-urgent. We can live with it until my business is bringing in more income. Any person will tell you that trying to get stuff done – like build a business – with small children around is difficult. I want to spend nap time working on my business, not cleaning up. Thankfully, I can now vacuum 80% of my house from one socket. We only have one (teeny tiny) bathroom to clean. Less time cleaning means more time working on my business. Saving time is as important as saving money for me right now. We’ve actively decluttered by reducing our belongings down to the essentials and those which give us joy. It’s a work in progress but eventually, we hope to get to the stage where our personal belongings are able to be packed up in a day – and stored securely – so we could take off travelling and leave just the core essentials for Airbnb guests. I’m committed to donating one bag of items to charity and listing one item of value for sale online each week. So far, I’ve made over $200 getting rid of stuff we don’t need. Often smaller accommodation is found in more densely populated areas with better local services. This is certainly the case for us. We purchased the smaller property for $30,000 less than the cost of our larger suburban property. Our new neighborhood is close to all amenities and is an employment centre with a lot of manufacturing and services. We have everything we need within walking distance which means we walk a lot. To the supermarket, the playground, preschool. This saves money on gas and other car expenses and is better for our health. We targeted the surrounding area when hunting for jobs for my husband and were successful in finding a position a ten minute bike ride away. This is great because he gets home sooner which gives me more time to work on the business while he wrangles the boys. Plus, we can remain a one-car family which helps to keep our expenses down. I have a dream of chasing the sun around the world. That means we’d like to be able to travel internationally for at least three months of every year. With two adults and two kids to pay for we require a travel fund of approximately $15,000 per year. To make that happen, we need to create a location-independent business and have our house generate income whilst we travel. By downsizing our house and slashing our expenses, we’ve been able to align our financial reality with our dreams. I’m so excited to put this plan in motion and I’m hopeful a lifetime full of travel will be worth the tradeoff of having to share my (only) bathroom with three boys for the next 18 years. Author bio: Emma Healey is a mother of two. 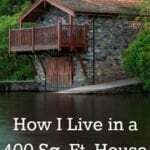 She writes about living well in small spaces with kids on her blog Little House, Lovely Home. Are you interested in downsizing? Why or why not? How much money could it save you? How Much House Do You Really Need? Do You Really Need That MASSIVE House? Sounds really good that you now live in a RV compared to a traditional house. It does cut expenses because you don’t have to wake up early in the morning and worry about taking a shower and getting dressed to go to a day job. You have the freedom and ability to move about as you please in the United States of America while earning a full-time income remotely by working online and blogging. That is in fact a dream life and the best feeling in the world knowing you’re not confined to living in any state and take your job on the road with you. Thanks DNN! I still wake up early and shower 🙂 What do you think of Emma’s decision (this post is about her, not me)? Emma’s decision to transform into a smaller living quarters is good for saving money. Like the article mentions, it allows her the financial breathing room to build the business without bringing on immediate income. Additionally, she has the flexibility of making money from our travels by having her laptop with her and possibly a speech recognition program installed whereas she can create content on the fly for her blog or website in the midst of traveling, with the option of including rich images and videos while on location and posting immediately to her site. Thanks DNN – I do intend to post on my blog regularly whilst travelling. Thankfully good internet is pretty much everywhere these days. Thanks for having me Michelle. I also work from home and agree that a daily shower is just as important as when you go to an office. Getting your morning off to a strong start is perhaps even more important when you are your own boss – I feel more productive when I’m dressed for the workday, even if I’m not leaving the house. 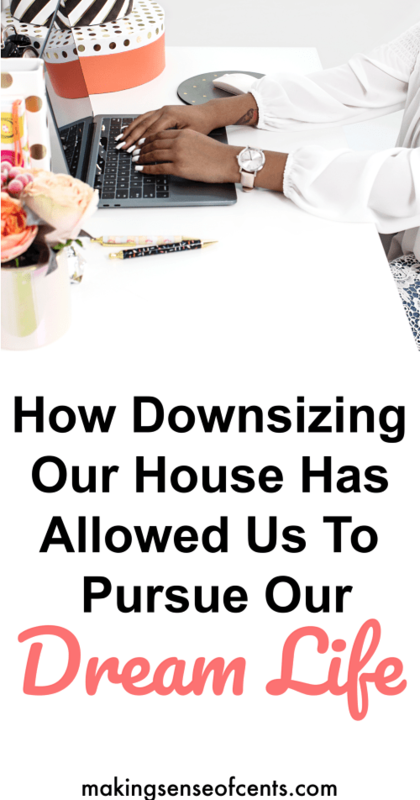 Downsizing is really beneficial! I did this 3 years ago and now I could finally say that it’s been worthwhile as I have been able to save and increase my savings. More than that, downsizing has enabled me to prepare for my kids’ education. Now, I have less problem when it comes to that matter. Thanks to downsizing. My assumption is when you mentioned downsizing, you probably had a company with a few employees. If this is so, how many did you possibly downsize? Agree Jayson. It’s great that downsizing your home has given you the financial breathing room to prepare for your kids education expenses! This is the ultimate dream goal here!!! I’m building a side business and my. Log to make this into a reality. I’ve been bit by the minimalism bug lately too. I’m trying to cut out as much as I can so I can so I can travel more. I’d love to be able to travel and have my blogging support me. I think a lot of us share that dream Justin. Luckily we have Michelle to inspire us with her amazing income reports. Nice post, Emma! The home we are living in now works for us and I am very thankful for it. My older kid is about 8 years away from college. Having the space and making good memories is on the top of my list and what we are up to now. Downsizing is on my list, but not just yet. This is definitely something we have thought about, but haven’t committed to. Where we leave, it is quite a bit cheaper to live in the suburbs, even though the commute is a little longer. By commute though, I mean a whole 15-18 minutes. If we were to move “in town” the property prices go up about $30,000-$50,000 depending on what you buy. Our house is definitely bigger than we need at the moment (2,700 sq ft) because we do not have children and even then, it would still be big. In our state (Colorado), it is very common to have a basement, so homes tend to be larger. But in reality, my ideal house would be 1,600-1,800 sq ft in total. We will likely stay here for the next few years and then consider renting it out. At that point, we would down size. My DH loves having space, but I think also now realizes we have too much. So, it’s something we actively discuss. Brittney, if your space works for you, that’s the important thing. Spending more to have less space doesn’t make sense in your area. My husband was initially apprehensive but now he loves our small house. I think he’d like a slightly larger shed but other than that it’s working out fine for him. In our most recent search for a new place to live, we are slowly realizing that our only option is to downsize. I’ve been in the process of purging our current home so that all our stuff will fit comfortably in the next place. It’s amazing how much stuff you can live without once you take the time to purge! I love this! Becoming location independent is a huge goal for us too. We’re a long way from it, but it’s something we’re working toward. I would like to do more downsizing, we have done quite a bit, but it’s still a work in progress. We have 6 kids, so minimalism is HARD. We recently moved and I was thrilled that our truck wasn’t even close to being full (not even the biggest truck they had!) It’s just a start, but I plan to keep downsizing as much as possible. Oh wow, 6 kids! I bet your house is a really fun place. My husband is one of 6 siblings and I love how much energy there is when all the siblings and their kids get together – big families are fun. But I can see how minimalism would be hard, remember it needn’t be absolute. You can just get rid of the things that don’t matter and always try be conscious of not buying too much. Thank you for sharing this! My husband and I have tinkered with the idea of being able to travel for long periods of time. I hadn’t even considered how a house plays into everything! What are your up and coming travel plans? How long do you usually plan on being on the road at one time? Thanks Mrs Picky Pinchers. This year we are planning to visit Mexico, Cuba and Costa Rica then head across to Europe to visit family in Ireland before spending a month in Spain. We are studying Spanish as a family so aiming for more practical time in Spanish speaking countries. We’ll be gone for at least 3 months but hopefully we can stretch it to 6 months. Wow, I love your ambition of chasing the sun around the world and traveling for months at a time – with your kids. It just sounds amazing and I’m in awe of how you’re doing this! I rent a place at the moment with my husband (and our little girl). When we do decide to buy, it will be on a small scale so that we can make the most of our lives rather than paying a great big mortgage off. Thanks Hayley. I think that’s a great idea. I see many young families (lots of my friends, even) mortgaging themselves to the hilt to be in a large house. I think that’s fine if you are a homebody (some people are) and don’t want to travel or have other priorities, but for the rest of us adventurers we must be ruthless with our limited funds. I would downsize this year if I would get most of these benefits or advantages especially reaching my financial goals. I can’t wait any more! Yay! I think this is a great solution to anyone who has specific goals that require saving a substantial amount of cash each year. 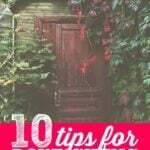 Downsizing in the beginning can be difficult, but once it’s done, it’s so much easier.